Earn Money From GetResponse Affiliate Marketing Program Monthly. GetResponse affiliate earnings is an excellent opportunity for you if you want to make passive income through affiliate marketing. GetResponse gives a high rate of recurring commission for selling any of their products. It is a sustainable way of making money. As long people who have purchased from your link, continue using GetResponse. In this article, we are going to talk about GetResponse affiliate earnings. Besides that, we will also speak about GetResponse affiliate commission. First of all, before we go for the affiliate program of GetResponse make sure you understand What is affiliate marketing and how does it work. 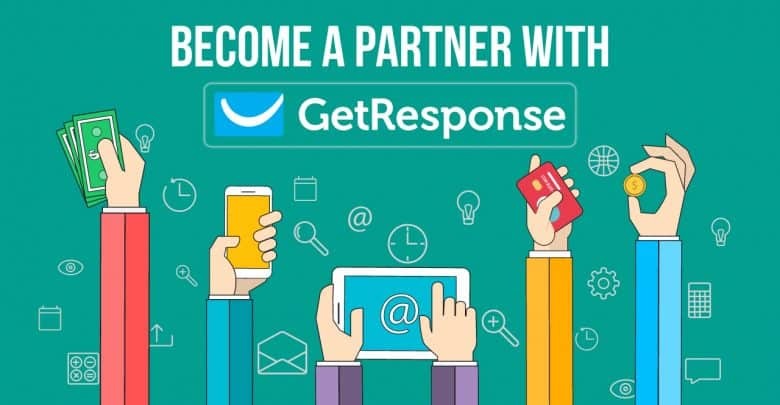 GetResponse is a reputed and popular platform who provide a complete email marketing solution tool. This email marketing tool offers lots of features like Autoresponder, GetResponse advanced analytics, landing page creator, CRM, and lots more. Their plans are also very affordable so that small bloggers, businesses can easily use their service. Their main highlighted features are customer relationship management and attractive landing page builders. By using their email campaign tool, you don’t need to look for a separate CRM platform. All your customer management information will be available on a single platform. GetResponse not only offers an excellent email marketing service but also give you a source of earning high commissions. They give you high commissions on sales. You have two ways on GetResponse affiliate earning. Affiliate Bounty Program- With GetResponse affiliate bounty program you get one time $100 for the sell. Affiliate Recurring program- GetResponse affiliate program gives you 33 % recurring commission on sales. That means till the user who buys through your affiliate link, use the service, you will be getting your commission. Four packages are available on GetResponse email marketing tool. Email: Pricing starts in $ 15 per month. Pro: Pricing starts in $ 49 per month. Max: Pricing starts at $ 165 per month. Enterprise: Pricing starts at $ 1199 per month. The pricing of the plans varies if someone goes for annual billing. If someone buys any package, you will receive a 33 % commission for that. For example, if anyone buys the Email plan for $ 15, you will get $ 4.95 as a commission. If someone continues to use the package, then you will be getting as long as the customer renews the package. Nothing could be better than this because you only have to sell once. GetResponse offers a wide range of tools to promote their affiliate links. With the text ads, banners, videos. It makes a lot easier to promote them. If you want to use the mail marketing tool you don’t need to give your credit card details. People freely can use their one-month free trial. They offer an outstanding email marketing service and 24/7 support. That attracts more people to use the service. They provide a high commission on sales, and it is not one time. Most of the companies give one-time commissions, but GetResponse gives you every month. One important thing about the commission is, for example, someone moves to a higher plan. You will get more commission as he chooses a more expensive package. You will get a 33 % commission as per his new plan. You can easily track your referrals at any time. They have a mobile-friendly affiliate panel. GetResponse has 120 days cookies policy. Sometimes people come through your affiliate link but don’t buy the plan on that moment. They see features, do compare with other companies and if they like, then buy. Most companies have the cookies policy so that if someone comes later directly, the affiliate gets the commission for the sell. GetResponse has 120 days. That means if someone buys in between 120 days coming by your affiliate link, you will get the commission for that. In comparison to other email marketing tools, there are several points which can attract people towards GetResponse affiliate earnings. Now if you are looking for an excellent recurring affiliate program, you can join the affiliate program. The minimum payout is $50, and they give the payment through check and PayPal. If you are interested and want to join the referral program, you can do so from below link. If you want to read more articles on affiliate marketing, you can read:- Know The Best Affiliate Marketing Niches For Bloggers In 2019, How To Start ClickBank Affiliate Marketing And Make Money, and AWeber Affiliate Program Gives You High Commission On Sales.